And the thing is, creating these so-called ‘vignettes’ has intimidated me for a very long time. These empty expanses of tabletops and mantels and niches and shelves just seem to mock me…taunting…go ahead…they say…we dare you to try and figure out how to decorate us. I would panic and do too much or not enough and never end up satisfied with the end results. So, I stopped. I stopped over-thinking it….stressing about it…letting those tabletops and mantels and niches and shelves get the better of me. I began to simplify the process. Realizing that, for me, creating vignettes in my home isn’t about the latest trend or the most Pinterest worthy concoction. It’s about putting things together that I love. The things that make me feel the most like…well…me! And that a vignette is really just a fancy way of describing a grouping of things that make my heart go pitter-patter. 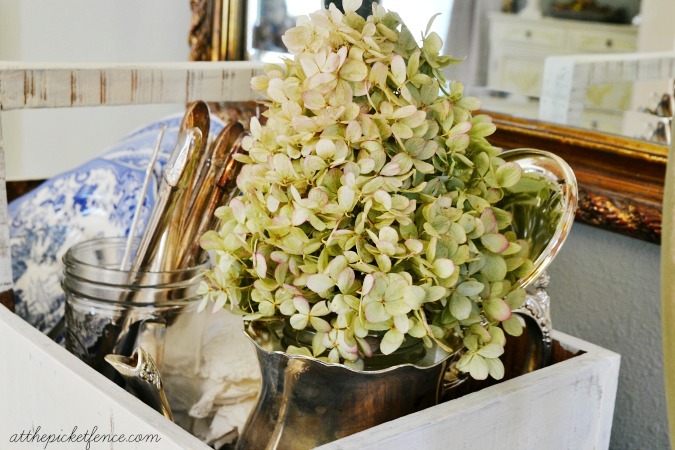 Like, dried hydrangeas in a creamy pitcher sitting on a large tray on my glass coffee table in the living room. Next to a photo of me and my 3 favorite people in the whole world. And a mercury glass box on top of a stack of books. It’s ok that my family room shelves aren’t filled to the brim. Frankly, they are fairly flimsy and can’t hold a lot of weight. So I made peace with the fact that they might only have 2 or 3 things on them. But that meant I could get away with adding more to the top of the built-in cabinet. Placing paintings strategically to cover outlets and adding seasonal decor like a simple bunch of wheat in an urn. I’ve realized that a vignette could simply be two lovely things together…each bringing out the beauty of the other. And that vignettes are as much about what is happening on top of a surface as they are about what’s happening all around it. Orange pumpkins piled high in a silver bowl (given to me as a wedding gift by my grandmother) provide the perfect pop of color underneath the neutral corn husk wreath and next to the cluster of wheat. And really, doesn’t everything just seem more special, more stately when placed on top of a stack of books? Of course, there are times when I break away from simplicity. Especially in the fall when it is virtually impossible to fight the urge to bring every single beautiful thing you see outside right on inside your home! Adding layer upon layer of texture and interest. 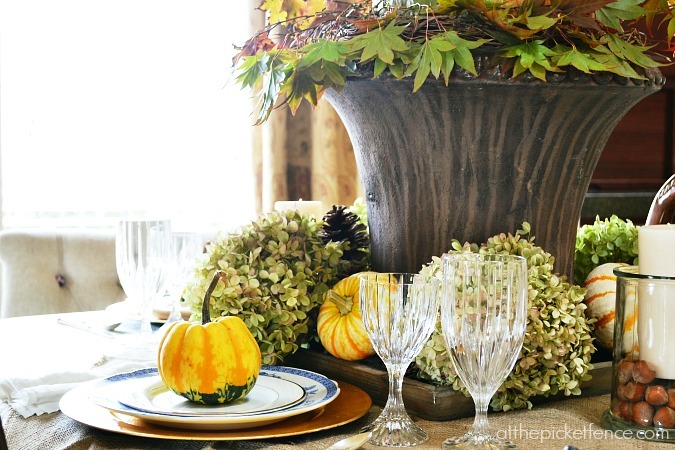 A pumpkin on top of a grapevine wreath wrapped with maple branches resting in an urn which sits on top of a wooden tray filled with dried hydrangeas and gourds on top of a simple square of burlap fabric. 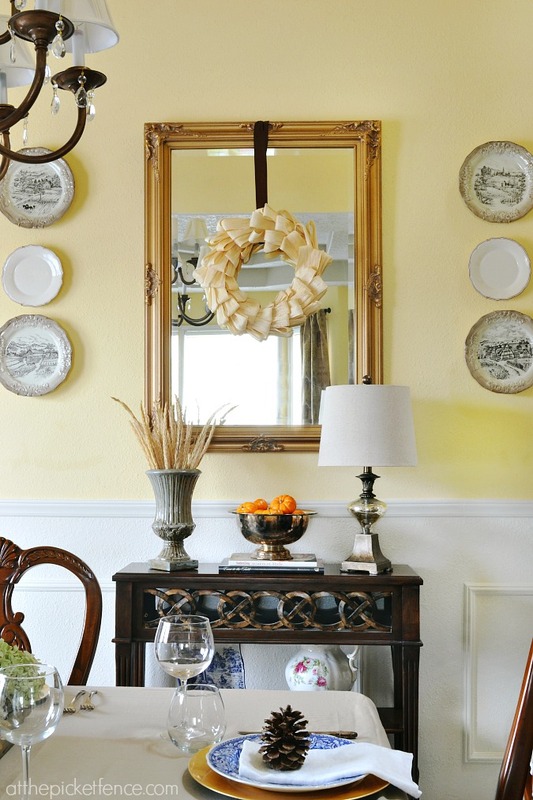 Maybe in one part of your home the perfect vignette would include raffia and candlesticks and pumpkins all in a soft palette with thankful platters hanging above. But to me, it’s no more beautiful than a single dried hydrangea bloom tucked inside a silver teapot. And that’s really what it’s all about isn’t it? Knowing that it’s YOUR home. And knowing that those expanses of tabletops and mantels and niches and shelves are simply your canvas. You can “paint” on them however you want. Whether you use lots of pattern and color or you stick to neutrals and clean lines. There’s never a right or a wrong as long as YOU love it! 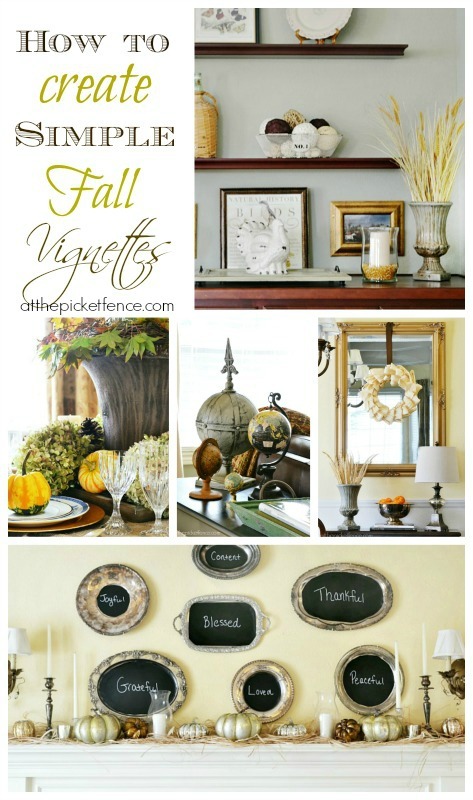 I’m so thrilled to be one of 25 bloggers in this series on creating fall vignettes. And I think that as you visit each one of these talented ladies you will see that while they are all different and unique in their approach, the one thing that remains the same is their ability to stay true to themselves. I hope you will pay them all a visit and that it will encourage you in your own endeavors towards making your home reflect who you are! 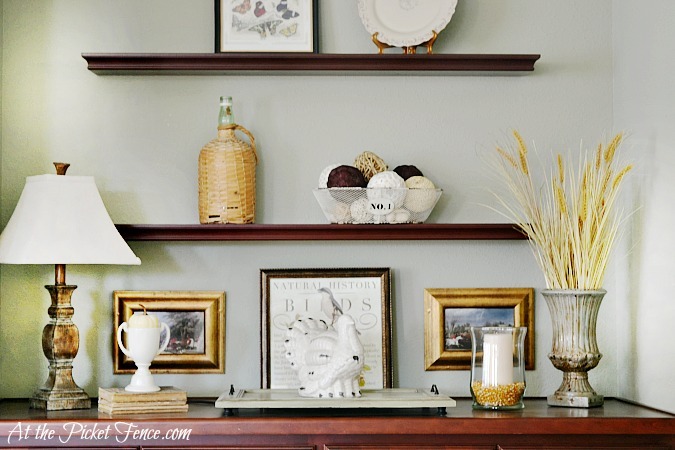 38 Comments on "How to Create Simple Vignettes in Your Home"
Those blank spaces stress me out too. Thanks so much for remind me that decorating is about me and what I love. I LOVE your post!!! You’re right…there are no rules, it’s about staying true to ourselves and reflecting who we are as we create a haven for our families. 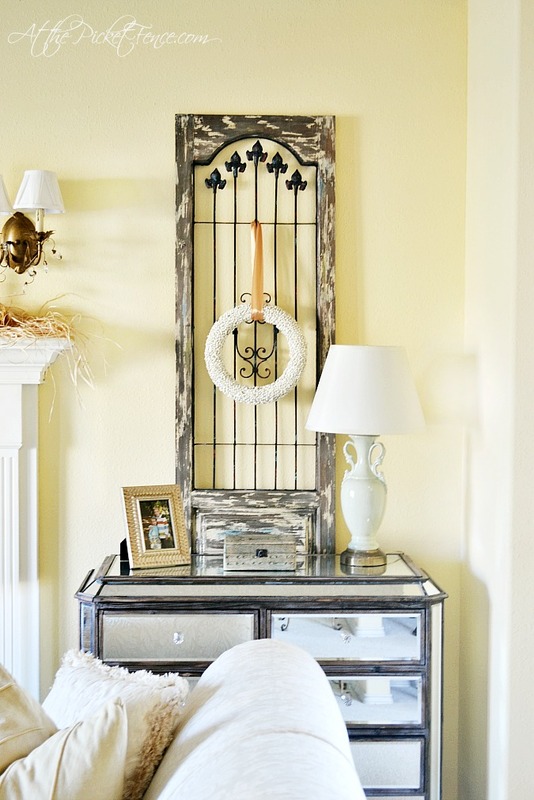 You have some beautiful vignettes going on in your lovely home!!! Beautiful vignettes and beautifully written, Vanessa. I knew your ideas would be great. Your post is so much like mine (except much better communicated!) I didn’t know what a vignette was, either, and it scared me to death to do this series! But you’re right. It’s all about what you love (and I love a good yard sale bargain!) that brings a smile to your face. Great job, Vanessa! You’re absolutely right, Vanessa! Thanks so much for this post. And thanks for being you–and letting YOURSELF shine through your decor and the way you share it! What a beautiful post, Vanessa! Your vignettes are beautiful and I loved what you said about creating a home that reflects ourselves and who we are. So dead on. It’s easy to get away from that when you’re looking at what everyone else is doing on their blogs and in magazines. Thanks for your inspiration today and so happy to be touring with you!! Great post, Vanessa! All of these vignettes are fabulous; and I’ve gotten some great inspiration for a project that I’m working on right now! I couldn’t agree with you more about putting together things that you love in one area. You did a beautiful job. I love the silver chalkboard wall, too. I already had one of them but not a collection on a wall which is just awesome. Your outlook on the whole process is perfect — no need to stress out on something to make your home personal and happy. Thanks for sharing. Enjoy your blog very much! Oh thank you so much for your sweet comment Dana!! 🙂 So glad you stopped by! 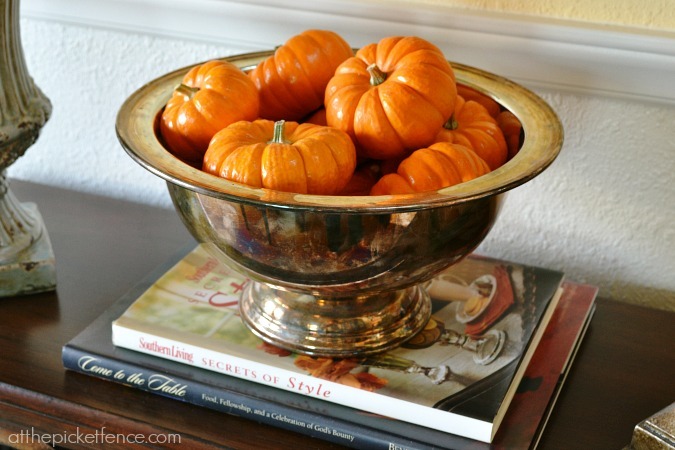 Vanessa what beautiful fall vignette inspiration! Love your chalkboard platters,love your open shelves creating a beautiful fall vignette!So thrilled to have you as part of the tour! Love it all Vanessa! Especially your credo, which is like mine…”it is your house…it has to feel good to YOU and make YOU happy”! The chalk paint silver trays I might just need to add to MY home too! Great to be on tour with YOU!! Ok for an ‘non-expert’ it all looks pretty awesome to me!! Thanks so much for joining us on the tour. I love your post… I can feel the same way. Each of your vignettes are gorgeous and most importantly they are things you love. Your vignettes are beautiful and very inspiring! 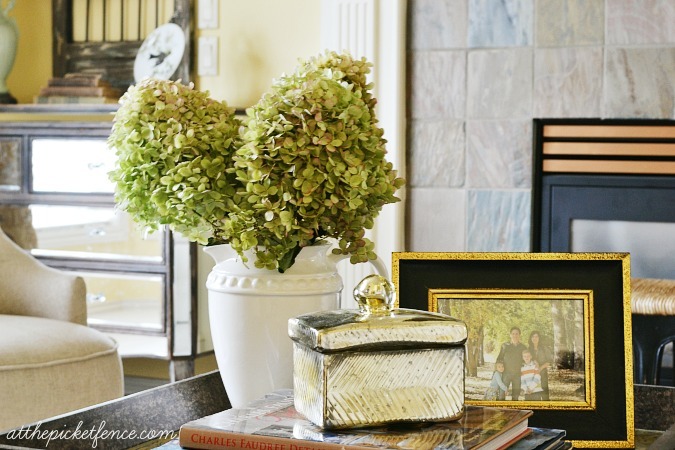 Beautiful vignettes my friend…I LOVE the centerpiece you created on your dining room table! Thank you Martina!! I definitely had fun doing that centerpiece and was sad to see it go. So glad you stopped by! I always knew you were a rule breaker! Loved the real message in your post. Do what you love! Yep, you got me…I’m a rebel vignette-er! 😉 Thanks for coming by Laura! 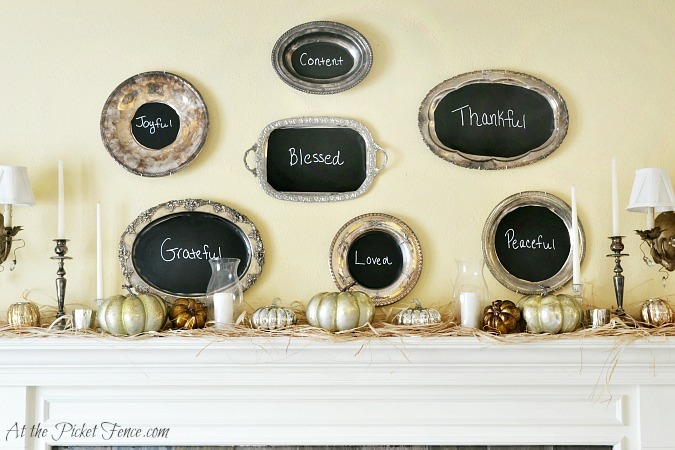 I love everything I see here…my favorite is those silver chalkboard platters. This is a great post on vignettes! 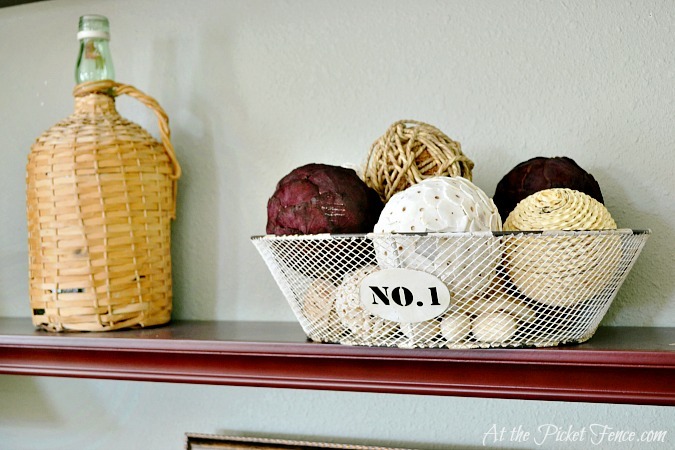 You’re exactly right…they are really just displays of things we love in our homes! 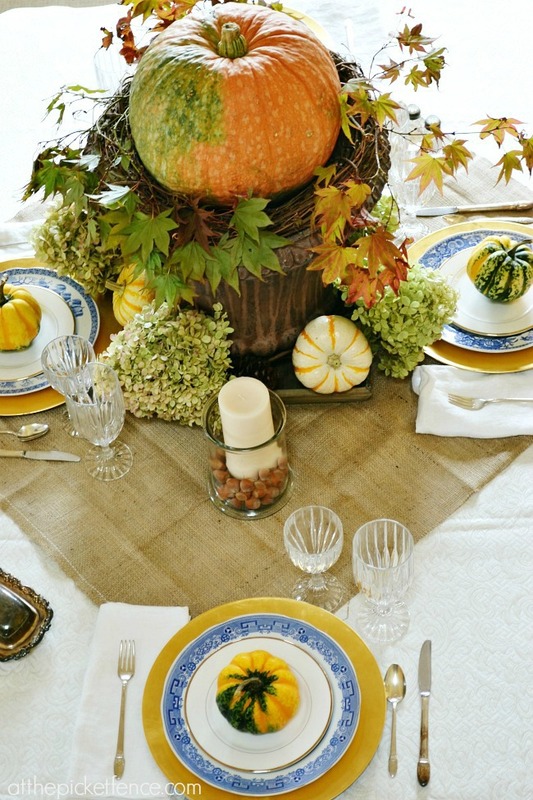 The pumpkin in the urn with grapevine and hydrangeas is just breathtaking…one of my favorites. I’m glad to have been part of the tour with you!